Like with Ben Milton's new Knave (http://questingblog.com/knave/), I like the idea of a character's role being determined by what kind of equipment they are carrying. Want to be a "fighter" in a classless system like ItO? Carry large, powerful weapons and wear armor. Want to be a "magic user"? Carry lots of Arcana (or spellbooks). A "specialist" (to use the LotFP term)? Carry lots of tools, poison vials, flashbangs, etc. But customization like this works best if there is a limit to how much stuff you can hold. If you have to choose between carrying weapons, carrying Arcana, or carrying tools, you are choosing between those roles. You can choose them all, but then you limit your specialization. So I'm looking at limiting how many things a character can carry. And if I'm going to be doing that anyway, is there anything else interesting that can be done with resource management? "One challenge in all this is that there's a kind of paradox to resource management. A situation where the players treat resources as important and plan ahead to have a sufficient supply is almost indistinguishable from a situation where the players and the judge all ignore resource management completely." "The two situations where resources are truly important are when resources run out and players face the consequences or when resources could run out and players adjust their behavior to ensure the they don't." 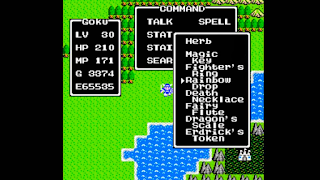 It is difficult for players to know how many individual rations, flasks of water, torches, etc. will be sufficient for the current session. In D&D-style games, players quickly have so much gold that buying more-than-sufficient quantities of vital resources is trivial. As a result of the above, players will usually have either so much of a vital resource that it ceases to matter or so little that it feels like they guessed incorrectly. The more differences items have in relation to encumbrance -- e.g. differences in weight, differences in number of slots they occupy, differences in which part of the body they can be carried on -- the more difficult the system is for players to manage accurately and efficiently. Call this the "How many was this thing per pound / per slot?" problem. So what are the items that are interesting when they've run out or are about to run out? I think ItO did a good job here with its list of the resources all expeditions are assumed to have: food, water, lanterns & fuel, camping equipment, and climbing equipment. You need food and water daily. You're blind underground without light. You can't sleep restfully outdoors without camping equipment. You can't climb safely without proper equipment. Also important is how ItO describes these as resources the "expedition" has rather than an "individual" has. These are resources that belong to and are used by the group, not by any individual. We could expand this idea to say that the quantity is either sufficient for the entire group, or insufficient for anyone. I don't think generic ammo (bows, guns, etc.) is worth tracking. This is one that players are likely to always buy more than enough of. It gets used frequently, which means it would have to be tracked frequently. It's one of those small items that leads to the "how many of these per pound / per slot?" problem. And there are other ways to create a missile vs. melee choice. Generic ammo is staying off of the character sheet. Not even going to bother with having characters buy it. To me, treasure has two interesting parts: finding the treasure, and trying to get the treasure home. Treasure being difficult to carry is an important part of the latter. You've found the treasure chest! Now, what are you willing to risk leaving behind so you can carry it? So treasure contributing to encumbrance is good. However, "wealth" -- the cash value of the treasure after you've sold it off, the random coins you've acquired along the way, etc. -- is not. I don't think considerations of "how much coinage do I want to carry so I can go shopping" are particularly meaningful. And coinage is suspect number one for the "how many per pound / per slot" problem. So treasure, you need to carry. Wealth, I'm fine with handwaving and saying you can spend directly from your total worth. If it's really important at some point -- e.g. Your home is under siege! How much of your wealth can you sneak away with? -- make it important then. For sandbox or FLAILSNAILS campaigns, I'm fine with characters not needing to carry all of their possessions all of the time. At each session, choose what you want to bring. Those things contribute to encumbrance. The rest stays at home, but can't be used. Only three states for vital resources: sufficient, resource about to run out, resource gone. Limit differences between items (e.g. weight, slots, location) in relation to encumbrance. Limit encumbered status to, at most, two states: normal and overburdened. Remove the guesswork about what quantity of a vital resource is needed for the current session. No math, no calculations, no more complex to track than just writing down what you have. And apologies that I lack Chris' gift for brevity in rules. Each character has 8 slots to carry items. All items are either normal or Bulky (per EB). Normal items take 1 slot. Bulky items take 2 slots. Note, there is no "X quantity of this item fits in 1 slot". e.g. If you have 4 vials of poison, it takes 4 slots to carry them. Per my magic rules, carrying 1 or more Bulky items makes spell casting risky. Per EB, carrying 2 or more Bulky items puts you at risk of becoming Deprived from fatigue. A single treasure is treated as a single, indivisible item. Some treasures are Unwieldy -- they cannot be carried in your inventory. You must come up with a plan, equipment, personnel, etc. to transport them. An important idea is the indivisibility of treasures. Take this into consideration when making your treasures. A heavy, golden vase makes a better treasure than a pile of gold coins. The latter immediately re-raises the "how many coins per slot" question. If you really want chests of coins, play the "It's a game. The chest of coins is a single, indivisible Bulky item" card. Aside from treasures, all other monies -- small amount of coins you loot from bodies, value of treasures after they've been sold off, value of equipment you've sold, rewards, etc. -- are simply part of your total wealth. Your wealth takes no space in your inventory and can be directly spent from in most situations. If even one character in the group is carrying a single quantity of the resource, there is a sufficient amount for the entire group to use. They have an expected use that does not ordinarily deplete the resource. Creative uses of the resource trigger a Luck Roll that may deplete the resource. If nobody in the group has the resource, the party suffers some negative effect. The meaning of "group" obviously changes if characters get split up. Penalty when lacking: Group is Deprived if they fail to eat their required daily meal. Remain Deprived until they eat food again. Note: The sandbox procedure triggers a Luck Roll against food each night when camping. Expected use: Drinking water during Short Rests to recover HP. Example creative uses: Dousing a fire, mixing a potion from herbs. Penalty when lacking: Group is immediately Deprived. Remain so until they drink water again. Expected use: Lighting the darkness. Example creative uses: Pouring lantern oil to start a blaze. Note: I'd suggest a Luck Roll after leaving any dungeon, etc. that you used your lantern to light. Expected use: Sleeping comfortably outdoors. Example creative uses: Catching a leopard in a sleeping bag and throwing it into the river. Penalty when lacking: Group is Deprived if they try to sleep in the rough. Remain so until sleeping overnight somewhere comfortable. Expected use: Assist with basic, vertical climbs. Example creative uses: Tying something up with the included rope. Using included pitons to spike a door. Penalty when lacking: Basic, vertical climbs become risky, require a DEX save. Note: Suggest a Luck Roll in cases where the party obviously cannot retrieve their climbing ropes, pitons, etc. 2 " " Arcanum Tool, vial, etc. 3 One-handed Weapon Arcanum Tool, vial, etc. 4 Modern Armor Arcanum Tool, vial, etc. 5 Tool, vial, etc. Arcanum Tool, vial, etc. 6 Tool, vial, etc. Arcanum Tool, vial, etc. Looks like a pretty good balance for a party of 3 people. We've got all of the Expedition Resources. The fighter has a strong weapon and armor. The magic-user has several Arcana. The specialist can carry lots of tools, flashbangs, poisons, etc. And everyone has room for at least one other "thing". Notice something though? The group has only one of each Expedition Resource. That's a "sufficient" quantity for the group's expected needs. But if a Luck Roll happens to deplete one of those resources, or one of the characters falls into a lava pit, the group now lacks that resource. So maybe two people should carry a "Food"? We've successfully eliminated the guesswork about exactly how many individual rations, how many flasks of water, how many oil flasks are needed, and instead replaced it with the question of: "How much redundancy do you want?" Or, what is your risk tolerance? Which is a more interesting question to me. It also happens to be an easier question to manage resources for. We suddenly have a lot of interesting choices. What happens to our example party once they've found the treasure? Gotta carry that Bulky thing back to town somehow. With only 8 slots, we're already pretty filled up. So, dilemma time. Do we dump some of our resource redundancy, thereby making the trip home riskier? Do we give up some tools, reducing options for dealing with encounters on the way back? Give the treasure to the porter we hired and hope he doesn't run off with it? So, 8 slots looks kind of good. The interesting choices become immediate ones, not ones that might happen only if the party has been picking up way too much stuff. Needs play testing still but looks like a good place to start. 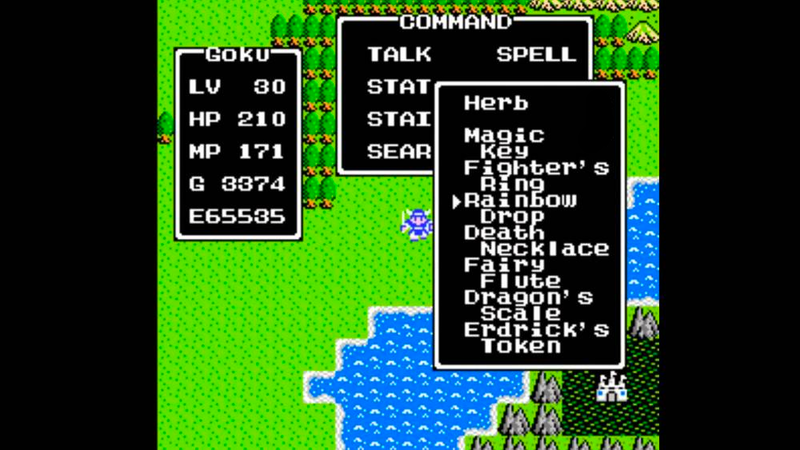 8 also happens to be the number of slots in the Dragon Warrior inventory, which you know makes me happy.